Field crops vary widely in their ability to compete with weeds. Even within one species, different cultivars may have very different competitive abilities. In general, the competitive ability of a crop is related to its ability to access resources including light, water and nutrients. It may be discussed as the ability of a crop to tolerate weed pressure and maintain yield, or the ability of a crop to suppress weed growth and seed production. Along with above ground competition for light, plants compete below the soil surface for water and soil nutrients. The below-ground characteristics that make for a competitive crop are not very well understood, but it appears that crops with more extensive root systems tend to be more competitive (Mason and Spaner, 2006). Rye > oat > barley > wheat > canola > field pea > soybean > flax > lentil (Blackshaw et al., 2002). This ranking may not be the same in all regions or growing conditions. Other sources place oat equal to or lower in competitive ability than wheat (Frick, 2000). Canola is considered to be a poor competitor early in the season and a good competitor later in the season. Pulse crops are generally poor competitors and fall seeded crops are generally better competitors than spring seeded crops. Choosing a competitive crop is one way to potentially suppress weed growth and seed production without as great a risk of sacrificing crop yield. Researchers in Montana compared wild oat growth and seed production in wheat and barley crops and found that barley suppressed wild oat significantly more than wheat. At harvest, the barley crop had about half as many wild oat plants as the wheat crop, and wild oat biomass and seed production was also reduced by about 50% in the barley crop as compared to the wheat crop (Lanning et al., 1997). This was most likely due to greater light interception by barley than by wheat. Crop varieties can vary considerably in their ability to compete with weeds. Although specific varieties are not developed with competitiveness in mind, certain varieties do seem to compete better with weeds than others. Cultivars may also perform differently in different regions and growing conditions, so that the most competitive cultivar in one case may be less competitive in another case (Blackshaw et al., 2002). There is some evidence that certain varieties, often older ones, perform better under high-stress environments such as drought and low soil fertility (Mason and Spaner, 2006). It is also important to remember that the most competitive cultivars are not always the highest yielding cultivars. All of these factors may influence the choice of crop cultivar for herbicide use reduction. In organic production, the competitive ability of a crop or cultivar becomes a very important factor. Weed populations are generally higher and chemical weed control is not an option. Soil fertility levels are also generally lower, affecting crop performance as well as weed growth. Modern grain cultivars are bred for high yield, quality, and resistance to insects and diseases. Plant breeding studies are generally conducted under conventional management and under weed-free conditions, creating a relatively low-stress environment for crop growth. This means that these cultivars may not actually be that well suited to the typical growing conditions experienced on organic farms. There is some evidence that certain cultivars, often older ones, are better suited to low-input farming systems (Mason and Spaner, 2006). A study comparing heritage and modern wheat varieties under organic management found that Red Fife had the highest harvest index and grain yield in weedy plots, while a modern cultivar performed best in weed-free plots, suggesting that Red Fife competed better with the weeds (Evans et al., 2004). There are also modern varieties that perform well in organic systems. University of Manitoba research found that under organic management, AC Barrie (modern) and Marquis (heritage) wheat performed poorly, while 5602HR (modern) and Red Fife (heritage) performed well, with high yield and good disease resistance (Pridham, 2006). 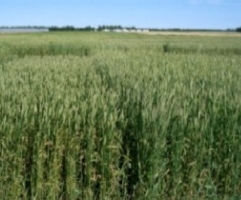 Read more at Cultivar Mixtures, Cover Crops, and Intercropping with Organic Spring Wheat. Growing a competitive crop such as fall rye, winter wheat, winter tricticale, or barley increases the likelihood that weed control with herbicides will not be necessary. Growing a competitive crop can reduce weed populations in a field and create better conditions for a less competitive crop the following year. Crop cultivars that have early vigourous growth and cover the ground quickly are generally most competitive with weeds. The competitive ability of different crops and cultivars may vary with the region, growing conditions, management system, and other factors. Therefore it is important for farmers to make observations and learn from their own experience with different cultivars. Blackshaw, R.E., J.T. O’Donovan, K.N. Harker and X. Li. 2002. Beyond herbicides: New approaches to managing weeds. ICESA. Buhler, D.D. 2002. Challenges and opportunities for integrated weed management. Weed Sci. 50:273-280. Evans, S., D. Patriquin and J. Scott. 2004. Small plot comparisons of phenology, yield, disease, and weed tolerance of three heritage and two newer cultivars of bread wheat under a high fertility organic regime in eastern Canada. Frick, B. 2000. Weed management. Pages 3-30 in Back to the basics: A manual for weed management on organic farms. Organic Producers Association of Manitoba, Virden, MB. Lanning, S.P., L.E. Talbert, J.M. Martin, T.K. Blake and P.L. Bruckner. 1997. Genotype of wheat and barley affects light penetration and wild oat growth. Agron. J. 89: 100-103. Mason, H.E. and D. Spaner. 2006. Competitive ability of wheat in conventional and organic management systems: A review of the literature. Can J. Plant Sci. 86: 333-343. Nazarko, O.M., R.C. Van Acker and M.H. Entz. 2005. Strategies and tactics for herbicide use reduction in field crops in Canada: A review. Can. J. Plant Sci. 85:457-479. Pridham, J.C. 2006. The effect of intercropping systems and cultivar mixtures on weed and disease suppression in organically managed spring wheat. M.Sc. thesis. University of Manitoba, Winnipeg, MB. Watson, P.R., D.A. Derksen, and R.C. Van Acker. 2006. The ability of 29 barley cultivars to compete and withstand competition. Weed Science 54:783-792.